The North American Aviation XB-70 Valkyrie was the prototype version of the proposed B-70 nuclear-armed deep-penetration strategic bomber for the United States Air Force's (USAF) Strategic Air Command. Designed by North American Aviation in the late 1950s, the Valkyrie was a large six-engined aircraft able to fly Mach 3+ at an altitude of 70,000 feet (21,000 m), which would have allowed it to avoid interceptors, the only effective anti-bomber weapon at the time. The introduction of effective high-altitude surface-to-air missiles (SAMs), the program's high development costs, and changes in the technological environment with the introduction of intercontinental ballistic missile (ICBMs) led to the cancellation of the B-70 program in 1961. Although the proposed fleet of operational B-70 bombers was canceled, two prototype aircraft were built as the XB-70A and used in supersonic test flights from 1964 to 1969. One prototype crashed following a midair collision in 1966; the other is on display at the National Museum of the United States Air Force in Ohio. 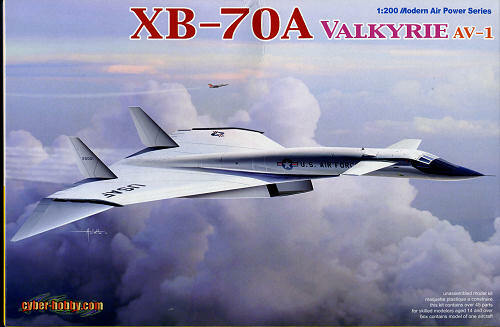 There have been other injected XB-70 kits in various scales by Lindberg and by AMT. This one from Cyber-Hobby is a brand new tool and thanks to the scale chosen, it will be a better fit on most display shelves. Thanks to the development of slide mold technology, the kit has been engineered with a relatively few number of parts. The forward fuselage is a single casting as is the majority of the main wing and the lower engine housing section. The kit can be built with the gear up, but the builder will have to come up with a stand as none is provided. This is a rather odd ommision as there is definitely a hole in the lower fuselage just for this feature. To go along with the gear up option, the kit has optional wing tips for at supersonic cruise, these would be drooped down for additional stability. Also in the cruise mode, the nose would ramp up to smooth out the airflow. Cyber-Hobby has taken care of this by making the upper nose section out of clear plastic and offering two different inserts. One is for low speed/ground and the other for high speed operation. There is a cockpit section that slides into the forward fuselage on a rail molded on the inside. It includes an instrument panel and seats with a decal being used for the panel. It is obvious from the sprues that there will be another kit produced as there are unused sections of the decal sheet for the second plane that was destroyed when it collided with an F-104 photo plane. No interior color information is provided, but dark gull grey seems logical. You can build the aircraft either as the initial flight and early test aircraft or a later version when NASA was operating the aircraft. Other than a few decals, both markings are the same. Despite not having a stand, this is a very nicely molded kit that looks as if it will fit together quite well. Those who have a penchant for prototypes will definitely want to add this one to the collection.